A great poster dated 1894 for public baths in Brighton & Hove, known as slipper baths because each bath was free standing with a roll top and one end deeper than the other resembling a slipper. These of course were not swimming baths but the only places in those days where most of us could get a bath or some families had a tin bath at home in front of the fire. Public Baths were still used in some places in the 1960's and 70's remember the first scenes in Quadrophenia with Jimmy ( Phil Daniels ) using the public baths. Really only from the late 50's and early 60's did houses with internal toilets and bathrooms for everyone start to become the norm. Remember as a kid collecting the galvanised bath from the cellar with Dad, hated it as I was terrified of the cellar. There was Dad, Mum, Auntie and big Sister so I was the last for a bath. The water would have been a bit murky hence the saying "Don't throw the baby out with the bath water". 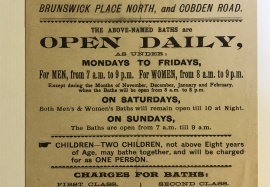 Cobden Road baths were opened in 1894 by councillor Ewart and then closed in 1976 there is a plaque in the entrance to commemorate the event.